These next few photos were almost all taken between my hotel and the conference hotel in Waikiki. Waikiki itself is rather boring. There's a lot of hotels, tourists, and expensive shops. 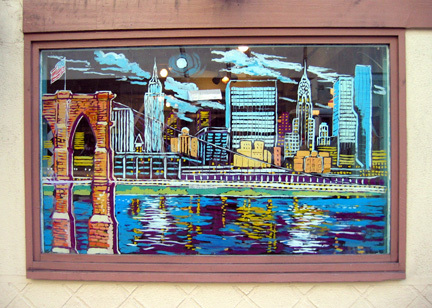 This New York-themed store window is in a closed-down branch of a Famous Ray's Pizza shop. Famous Ray's is all over Manhattan. Their fame derives from the awfulness of their pizza.